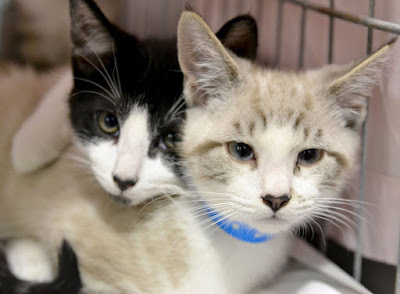 Animal Friends: Adopting Two Cats is Twice as Nice! Shelters face tough times during the spring and summer … it’s the dreaded kitten season. This is when the weather gets warm and cats give birth. Shelters struggle to accommodate the overwhelming influx of kittens that come through their doors each year. And, Animal Friends is certainly feeling the effects of kitten season. We have more than 50 homeless kittens waiting to find loving families. So we need your help! Right now is the perfect time to adopt a sweet kitten … or two! At Animal Friends we know it’s twice as nice to adopt two kittens at once. 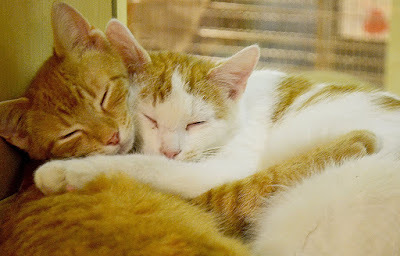 Many cats are social creatures and will love having a sibling to groom and cuddle with during naptime. Often times, destructive behavior in pets is traced to boredom. Having a companion will keep them out of trouble! You can experience the joy of having a friendly greeting when you return home without feeling guilty about leaving your pet home alone. Two cats means double the love, an extra dose of fun and twice as much snuggling! Most importantly, adopting two cats actually saves four lives – the two you’re adopting and the two that will take their spots on the adoption floor at Animal Friends! So, come to Animal Friends or visit ThinkingOutsideTheCage.org/Cats to meet our adoptable kittens today!